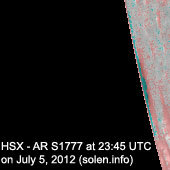 Last major update issued on July 6, 2012 at 07:30 UTC. 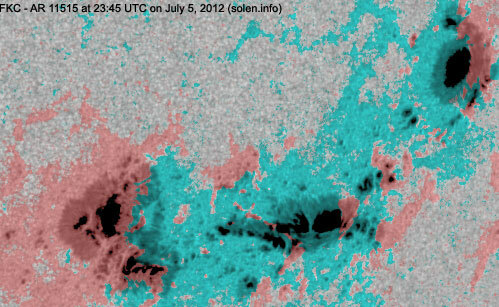 The geomagnetic field was quiet to active on July 5. 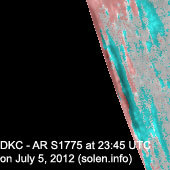 Solar wind speed at SOHO ranged between 445 and 653 km/s. 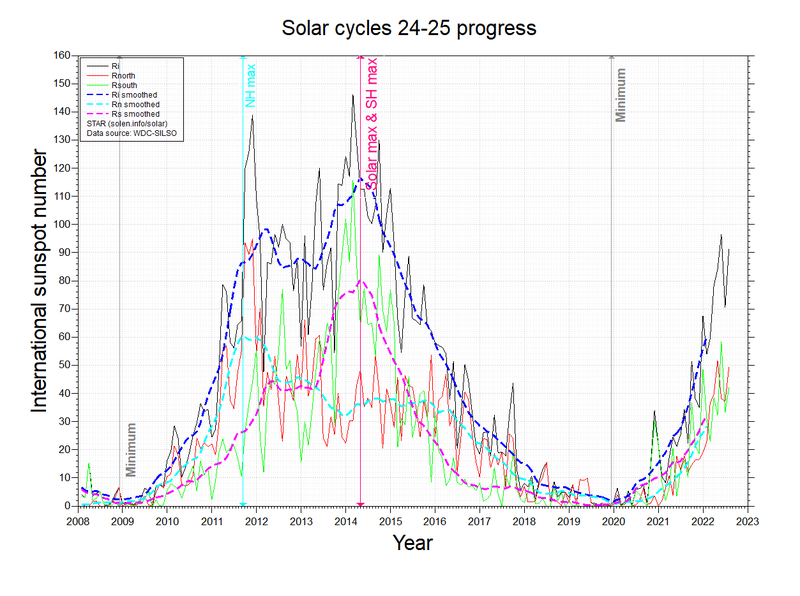 Solar wind density increased slowly early in the day (the high speed stream from CH521 ended late on July 4), then dropped to very low levels at 06:00 UTC coinciding with a significant increase in solar wind speed (a possible reverse shock). 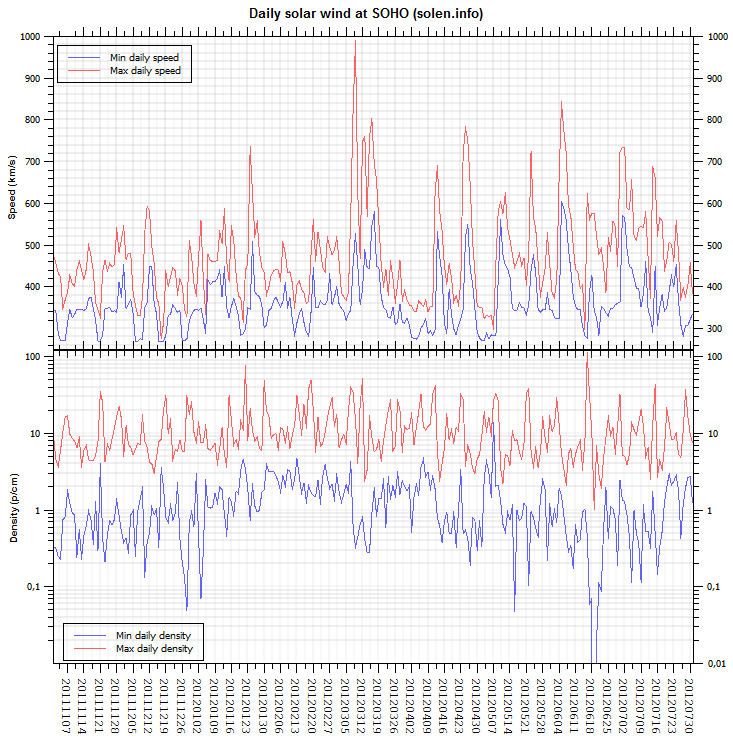 After 10h and until 16:30 UTC density again generally increased slowly, then dropped significantly before suddenly increasing near 19h UTC and reached its highest level of the day just before 20h UTC. These sudden changes in density were reflected in GOES magnetometer measurements and an unsettled to active geomagnetic field. 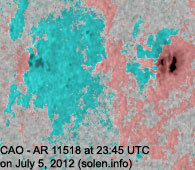 The source of these disturbances were likely recent activity in AR 11515 as there were no indications of a high speed coronal hole stream. 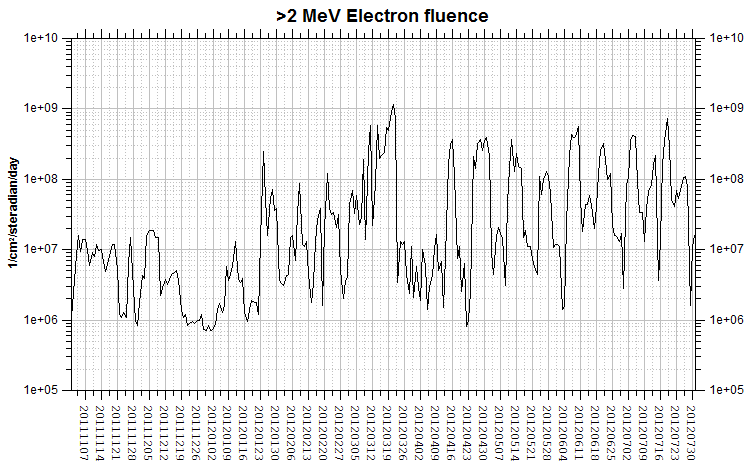 Solar flux measured at 17h UTC on 2.8 GHz was 150.8 (increasing 26.6 over the last solar rotation, the measurement at 20h UTC was flare enhanced. 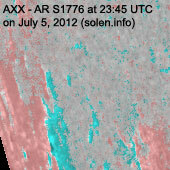 Adjusted to 1 AU and removing all flare enhanced measurements, this is the highest solar flux in 2012). 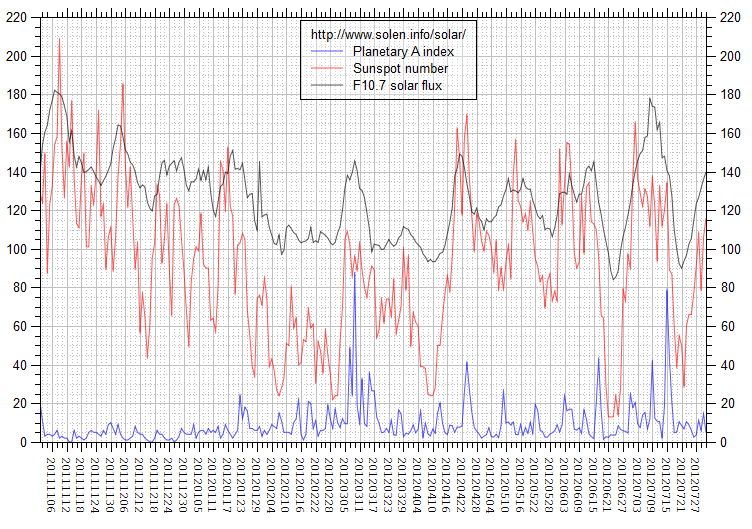 The Potsdam WDC planetary A index was 14 (STAR Ap - based on the mean of three hour interval ap indices: 14.3). 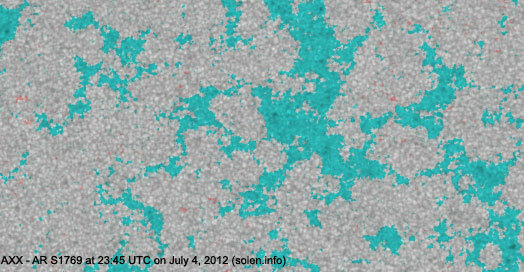 Three hour interval K indices: 22144323 (planetary), 22134333 (Boulder). 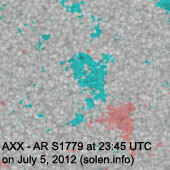 At midnight UTC the visible solar disk had 14 spotted active regions (in 2K resolution SDO images). 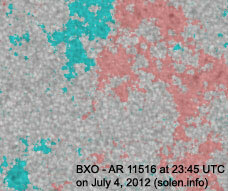 Region 11513 [N15W51] decayed losing most of the small spots and simpified magnetically. The single penumbra was mostly unchanged. 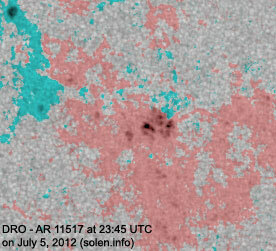 Region 11514 [S18W49] decayed further and could soon become spotless. 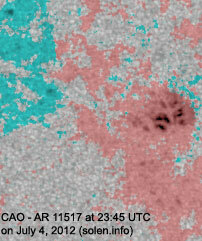 Region 11515 [S17W38] lost a few spots and what was a major magnetic delta decreased in size and importance. 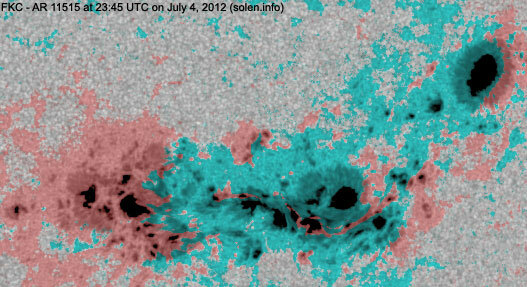 There are currently small magnetic delta structures in all large penumbrae. 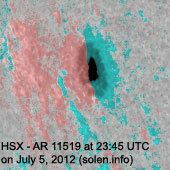 M class flares are highly likely and there's a chance of an X class flare. 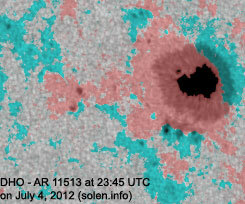 Flares: M1.2 at 00:38, M3.7 at 01:10, M1.2 at 01:31, C9.9 at 01:41, C8.1 at 02:05, C7.9 at 02:26, M3.3 at 02:42, M1.1 at 03:31, M7.8 at 03:36, M3.0 at 03:42, M1.1 at 04:45, C8.5 at 05:05, M1.2 at 06:53, M1.6 at 07:45, C8.0 at 09:30, M2.3 at 10:48, C9.2 at 10:56, M8.7 at 11:44, M1.4 at 13:20, C9.5 at 13:55, C8.4 at 14:46, C6.1 at 15:59 ... UTC. 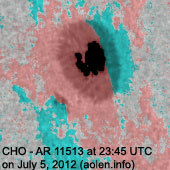 In addition 2 M and several C flares were recorded later in the day. 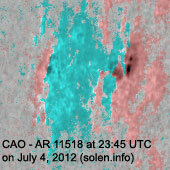 The flare list is according to SDO/SAM/EVE 1 minute measurements. Region 11517 [N19W26] added a few spots but lost mature penumbra. 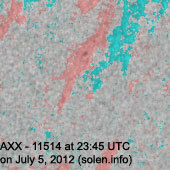 Region 11518 [N09E53] was quiet and stable. 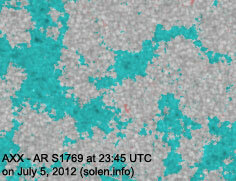 Region 11519 [S16E62] was quiet and stable. S1767 [N20W38] developed slowly and quietly. S1769 [N16W13] quietly added a few spots. S1774 [S26E64] lost a spot and was quiet. 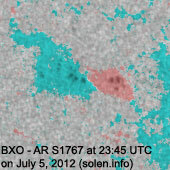 New region S1775 [S19E84] rotated partly into view revealing large spots and a compact structure. M class flaring is possible. 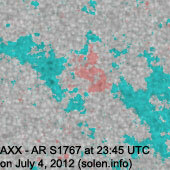 New region S1776 [S16E75] rotated into view with a single small spot. 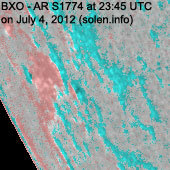 New region S1777 [S13E87] rotated partly into view with a single spot. 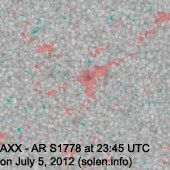 New region S1778 [S28W13] emerged with a single small spot. 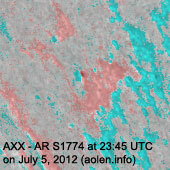 New region S1779 [N15E03] emerged with a tiny spot. 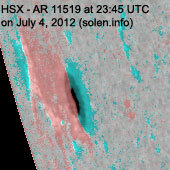 July 3 and 5: No obviously Earth directed CMEs were observed in LASCO and STEREO imagery. 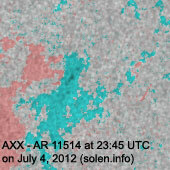 July 4: A weak CME observed after an M1 flare in AR 11513 could reach Earth on July 7. 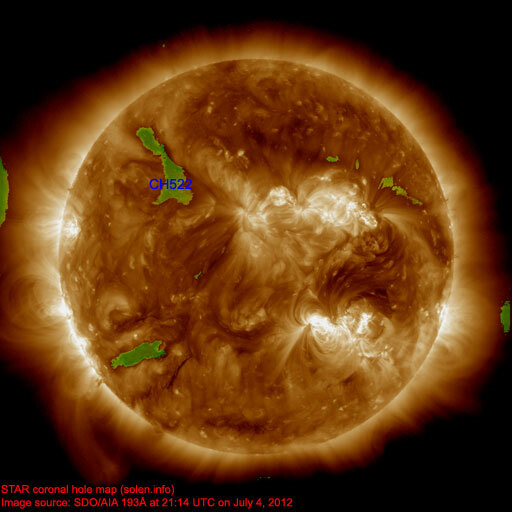 A coronal hole (CH522] in the northern hemisphere could rotate into an Earth facing position on July 6-7. 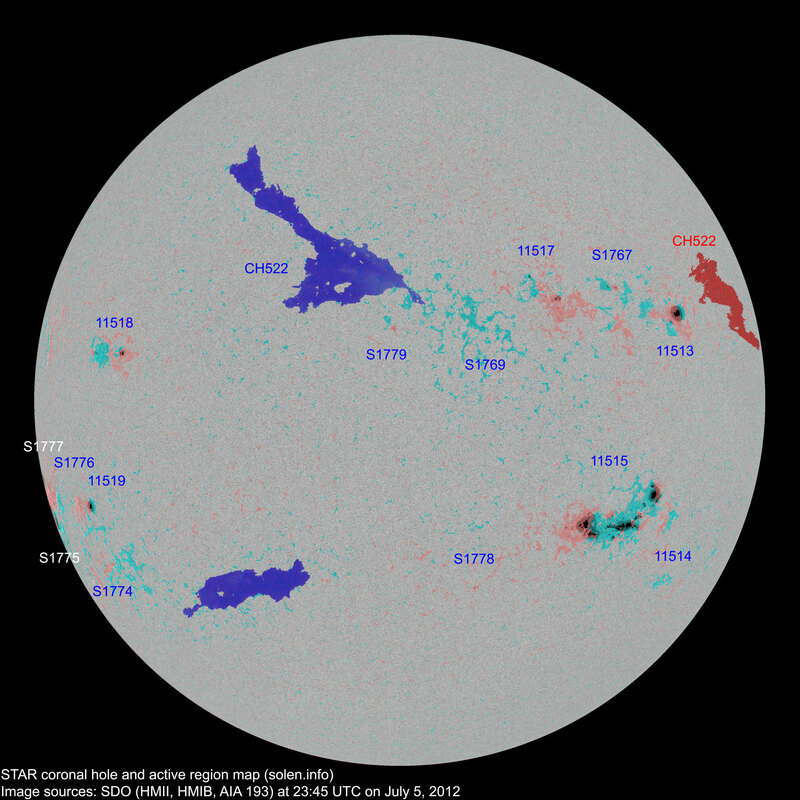 The geomagnetic field is expected to be quiet to active on July 6-8 with a chance of occasional minor storm intervals due to the recent CMEs from ARs 11515 and 11513.